As we all know, the 1st of July is a very special day. Not just because it is the height of summer and all the flowers and leaves are out. Not just because the sun (usually) is out and the smell of BBQ is in the air – though these are all good reasons to celebrate! No, it is because 1st of July is Canada Day! All over the country, people will celebrate this important day in the Canadian calendar and no other place celebrates this day better than Niagara-on-the-Lake! 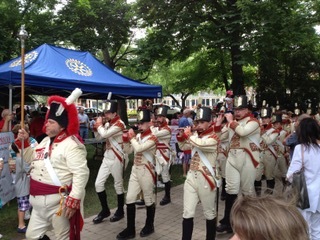 For quite a few years now, the main Canada Day events in NOTL have been organised by Niagara-on-the-Lake Rotary Club and the Friends of Fort George. For those who don’t know, Fort George is the historic fort on the edge of town that was at the centre of the war of 1812. This year, Rotary Club got more involved than ever before and will eventually run the entire event. As a member of the Rotary Club, I along with all other members, partners and many volunteers have been involved with helping to run the Canada Day events in town. As dawn breaks, many of us turn up at Simcoe Park opposite the famous Prince of Wales Hotel to help set up tents, barbecues, griddles, tables, chairs, flags, fences, ice cream stand, coffee and tea making facilities, and the many other things that need to be lay out before the crowds arrive. Roping off parking spaces for deliveries of hot dogs, rolls, burgers, drinks, etc. This is a BIG fundraiser for Rotary Club as the crowds start to arrive early in the morning and the griddles are heated up, ready to start turning out hundreds of pancakes, maple syrup and sausages for breakfasts. The coffee/tea station is ready to go and the team are working hard to keep up with demand as the line-up grows. In the background, there is music, bag pipes in the distance, Salvation Army Band, the Simcoe Park Bandstand sets up for some bands arriving later. On the other side of the park, there is a classic car display. The usual crowds who visit Niagara-on-the-Lake on a typical summer’s day, pale into insignificance compared to the crowd we have on Canada Day! By then, it is around 12:00 and we switch from cooking breakfasts to starting the lunch shift. Burgers and hotdogs are unwrapped and the barbecues are ready to go. Once again, the line- up gets bigger as we work harder and harder to keep up. Ice cream sales are way up as the heat of the day increases. Bottles of water are selling out fast! About mid-afternoon, the parade begins and the Lord Mayor of Niagara-on-the-Lake makes his way along Queen Street in the back of a convertible, waving at the crowds lining the street as the procession moves into Simcoe Park. Every year, there is a huge cake, baked by a well-known local bakery that takes its place in the parade. At the end of the route, a big group of people is just waiting for their slice of the cake if there is any room after the breakfast and lunch! As the afternoon turns to early evening and the crowds start to disburse, heading home or back to their B&Bs, we begin the task of packing up all stuff once more. That is it for another year. Next year, Canada Day will be even bigger and better than this year. It always is. This entry was posted in Blog on June 29, 2017 by wp_admin.